Kids are born with an innate curiosity and love for animals which leads them to question the food habits of animals. 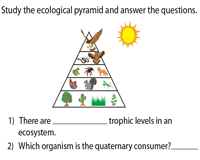 Spark the interest of students of grade 2 through grade 7 with these meticulously designed food chain worksheets to interpret terrestrial, aquatic and forest food chains, comprehend food webs and flow of enegy in the energy pyramids, get acquainted with frequently used terms in the ecosystem vocabulary, learn to classify animals based on food, differentiate between autotrophs and heterotrophs and a lot more. Enrich your knowledge and vocabulary with key terms like ecosystem, heterotrophs, autotrophs, producers, consumers, herbivores, carnivores and their definitions with this printable ecosystem-vocabulary chart. 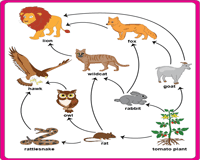 Introduce the topic with this printable food-chain chart. The kids learn "Who-eats-what" in both terrestrial and marine ecosystems. The visually appealing chart is sure to develop curiosity in kids. 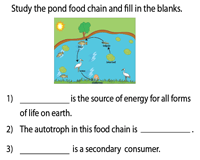 This food chain chart specifically illustrates the pond food chain and is accompanied by a fill-in-the-blanks exercise to check comprehension. The kids decipher the food chain and plug in the appropriate words. 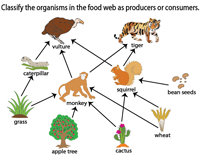 The food web chart illustrates the feeding relationships among species in a terrestrial community and assists kids in distinguishing a food chain from a food web. Learn about the transfer of energy as well. 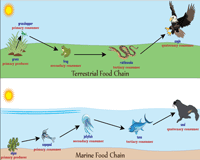 This vividly laid-out marine-food-web diagram shows the interdependence of animals in an aquatic ecosystem. The children are expected to answer the questions by observing the food web. 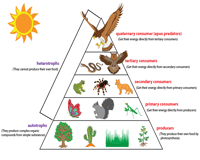 The energy pyramid or trophic pyramid chart distinctly shows the transfer of energy from one trophic level to the other. Reiterate the key terms like producers, primary consumers, secondary consumers and more! Comprehend the flow of energy in this ecological pyramid chart or the energy pyramid chart. 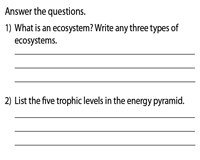 Test comprehension with the set of questions that follow in this energy pyramid worksheet. Get a clear picture of the conceptual knowledge of students with this answer-the-following worksheet. Included here are questions like listing, distinguishing and explaining to reaffirm the concept. 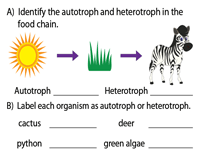 Distinguish between autotrophs and heterotrophs with clearly stated examples, classify organisms as autotrophs or heterotrophs and identify them in a food chain in this autotrophs vs heterotrophs worksheet. This interesting prey-and-predator activity worksheet presents real-world scenarios involving preys and predators. The kids read the sentence and identify the prey and predator in each scenario. Reinforce the concept of prey and predator with this activity. 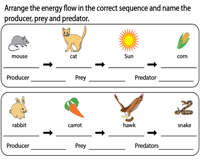 Arrange the pictures in the correct sequence of energy flow and spot the producer, prey and predator in this identify-the-prey-and-predator worksheet. 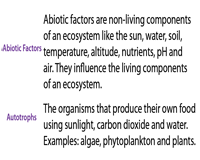 A set of organisms have been listed out and the children are expected to classify them based on their food habits as producers, consumers or decomposers and label them accordingly. 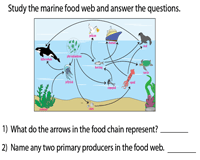 Study the food web and classify the ten organisms presented as producers or consumers and write them in the specific columns in this producer-consumer-classification worksheet PDF. 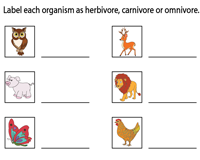 Ponder on what the animals eat and label the plant-eaters as herbivores, meat-eaters as carnivores and both plant and animal eaters as omnivores in this herbivore-carnivore-omnivore-labeling worksheet. 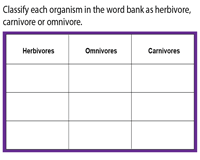 The word bank consists of a list of organisms, the children are expected to sort them and tabulate them in the correct column in this herbivore-carnivore-omnivore-classification worksheet. 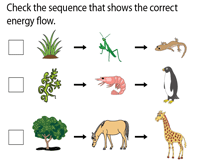 Analyze each of the given food chain diagrams and check the ones that depict the correct sequence of energy flow in this spotting-the-correct-food-chain worksheet. 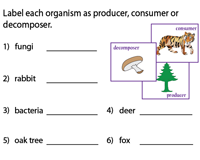 This forest-food-chain-cut-paste activity worksheet presents a linear food chain. Snip the picture cards, sequence them in the order of energy flow and glue them in the correct boxes. 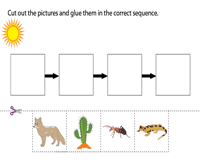 Learn about the desert biome with this desert-food-chain-cut-paste-activity worksheet. 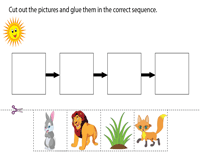 Cut the pictures and paste them according to their trophic levels to complete the activity.